Yesterday when I got home from work I was ready to GO! Does anyone else have issues with doing speedwork on the treadmill? I can run fast much more comfortably outdoors where I feel in control. On the treadmill I constantly feel like I’m half a step away from flying off! 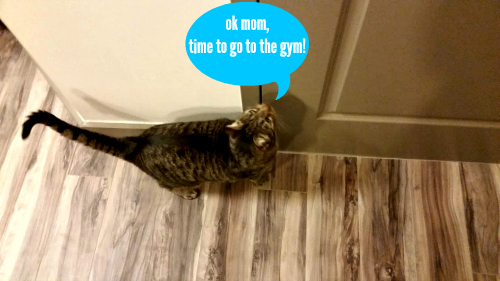 I won’t be going to the gym for speedwork again for a while. I need to get back to running outdoors anyway. Our new place is about a mile away from our old place, but that extra mile is punking me out. It’s completely through a little neighborhood, and I prefer sticking to the main roads. Tomorrow I WILL run outdoors again. My Garmin misses going out for a run! Yesterday I took myself to lunch (I really think everyone should do this at least once per week) and enjoyed some delicious soup! … and then I left my keys at the restaurant! Since I had walked there I didn’t realize I left my keys until it was time for me to go home from work. Thankfully the staff held on to them for me! I still can’t remember why I took them out of my purse at the restaurant to begin with. I got that keyring when we were in London last year :). Whenever I look at my keys it reminds me of the best vacation ever! I have another, separate keyring that is of the Eiffel Tower and it holds my “non-essential” keys. You know, the ones I don’t use on a daily basis like the keys to my parent’s homes and the key to my office (I’m hardly ever the first one there). Call me crazy, but I hate having a bulky keyring so I have to keep all the essential keys and non-essential ones separate. Anyone else do that? I know I can’t be the only one! 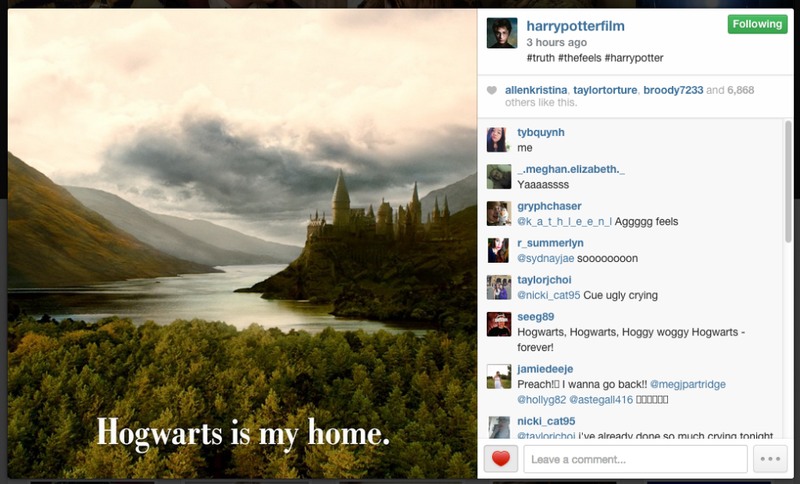 I may need to spend a little time this weekend re-watching one of the HP movies just because. 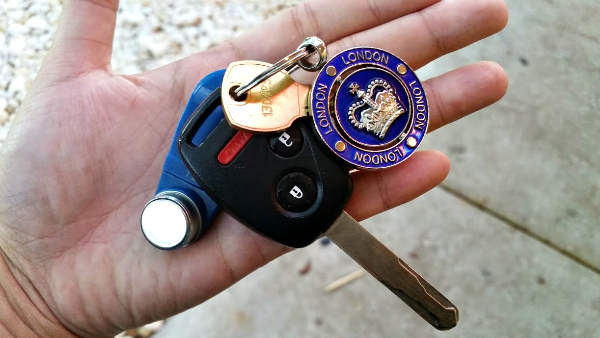 Do you lose your keys / lock them in the car a little too often? My first car didn’t have automatic locks and I used to lock my keys in the car all.the.time. AAA was on speed dial! Previous Post Officially Back to Training! Next Post 2 Years Ago I Was Getting Ready to Run My First Race! You are not alone in the key department. I have had to have people out to my house to unlock vehicles 3 times!!! Yes both sets in the vehicle and it is locked! I really need to stop carrying both sets in my purse! I don’t like the adjustment period either! I always account for 10 seconds of adjustment while the treadmill is ramping up or going down in speed. I can’t imagine doing a hill workout! I am sure I would slide right off! Glad to see the return to training is progressing. I hate doing anything on the treadmill, avoid it like the plague. I have separate key rings, the one with the important keys had as little as possible, I hate bulky key rings. You can’t go wrong with The Sorcerers Stone and reading about all the characters. I also like Prisoner of Azkaban. I’m so happy to hear that you and others do the two keyring thing as well! Totally agree about Sorcerer and PoA. I love the Shrieking Shack scenes! I never lose my keys haha, i just always keep it in my purse. So many votes for PoA! I like that one a lot too because I loved learning more about James and the gang when they were at Hogwarts! It’s weird to me that so many people say they feel like they can’t run as fast on the treadmill….I have the opposite problem. It always seems like paces are a little easier than they should be when I’m on the mill. I always have set the treadmill pace to 30 seconds faster than the pace I intend to run at to make up for this. Go figure. Wow, that’s so interesting! When I’m outdoors I can hold 30 second intervals in the 9 – 9:30 minute range but yesterday on the treadmill 10 min was about as fast as I could go while still feeling somewhat in control of my legs! Oh my! I’m glad you found your keys. That’s the worst when you can’t find them and search everywhere. Once I found my keys in the fridge! Oy! I used to not carry and keys. My truck and our Flex both are push-button starts so I just keep both key fobs in my purse. We come in through our garage and so I don’t have a house key either. I do keep the keys to the venue with me all the time now. Ohhhh fancy push start buttons! 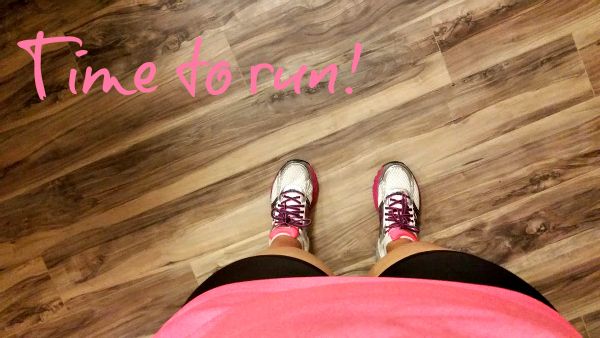 I get nervous running fast on the treadmill, so I totally understand what you are saying! I haven’t locked my keys in the car in awhile, which means I am due. Luckily, I finally got an extra key to my car (I only had one) so I won’t have to call AAA next time it happens! I am probably due too! Adam has the spare key to my car BUT I seem to always lock my keys in the car at times where it would take too long for him to get to me and it’s just easier to call AAA. I locked my keys in my car one time during my internship in college and freaked out because I was late for a test. I tried to call my professor and email him but he didn’t respond and I was freaking out so hard. A friend came and drove me to class and then the prof. let me leave right after so I could go meet AAA. I will never forget how panicked I was that day! Funny thing is I love to do speed twerk-outs on the treadmill vs. outside. I like that the treadmill sets the pace for you and you don’t have to constantly look at your garmin to make sure you are holding the pace. BUT I often do imagine myself flying off the back, so that’s fun. Ugh, ****outcast**** over here. I never got into HP! I know, I know, you’re throwing tomatoes at me as we speak. I prefer to do speedwork outside as well. The treadmill just doesn’t feel right and I think I go a lot faster if I’m just trusting myself rather than setting a number. Oh WOW all of them over one weekend! That’s impressive! How are you feeling now? I hope you are feeling better today! I don’t run on treadmills I just can’t make myself do it, so speedwork is always done outside haha. My favorite Harry Potter is the Half-Blood Prince. My favorite Harry Potter book (and movie) is actually Order of the Phoenix, followed closely by Prisoner of Azkaban! I actually keep my keys separate as well. I have a key ring wallet with my house keys, office key (sometimes I get there first or leave last but rarely on the same day! ), and membership cards for gym/grocery/library. Zach and I actually have three cars between the two of us. Long story but let’s just say that before we got engaged he just had his car and I had zero (rode the bus/walked), LOL. Because of that it’s much easier to just grab the car-specific keys in the AM. OOTP holds a special place in my heart because it was the first one where I waited at a bookstore at midnight for the release. I sadly didn’t start reading the series until after GOF had already come out. Three cars? You went from right to three? Overachievers! I seriously love the floors in your apartment. So pretty! I actually enjoy doing speed work on the treadmill because I feel like I am in a controlled environment and can hop off at any moment. But I know what you mean about flying off – it has happened to me before. I just saw the last of the Hobbit movies and was thinking that I am due to watch the Lord of the Ring soon. You have actually flown off the treadmill before?!?! OMG! You know, I LOVED the LOTR movies but I could not get into the books at all. I think that is the first time I have ever had a book-movie experience like that! I just realized we are shoe twins (color too). 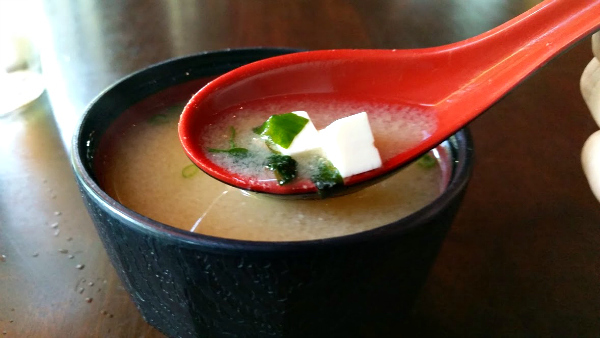 Your soup looks good – miso? I just had some today – but used a packet from the Japanese market. I also have two sets of keys – I carry my apartment keys with me everyday and its hooked to my carabiner. I leave my car keys/my parents house keys (nonessentials) in my apartment. When I need to drive I hook it back onto the carabiner. Otherwise it is too heavy. We are shoe twins! Whenever I would see you in the blue ones I would always smile. I love the pink/white ones so so much though. I’ve stocked up on them because I don’t love the color options for 2015! I also feel like Im gonna fly off the treadmill if I try to do speed work on there! Glad you found your keys! That flying off feeling is just awful, I seriously get so nervous it’s the only thing I can think about which makes me even more nervous! Speedwork outdoors is infinitely better for that reason! Mmm miso soup is my favorite!! I have a smart key for my car, so I can detach all my regular keys when I don’t need them. My only fob is a Hamsa.